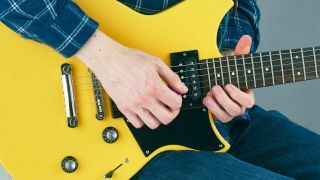 WORLD GUITAR DAY 2017: Take the less is more approach to guitar practice and repeat a selection of easy lead lines designed to focus your muscle memory and improve your soloing skills. Use three fingers for strength. Keep your fingers rigid and turn your wrist to bend the string. Two notes should sound at the same time here: the string bend and the second note on the second string. Start by bending the string up from the 8th fret to the 10th fret. Then pick the string and release your bend. Play the 5th fret with your first finger and pick the string. Hammer on with your remaining fingers. Start with your fourth finger on the 8th fret and pick the string. Pull off to sound notes at lower frets. Keep your fingers squarely in line with the frets for this mixture of hammer-ons and pull-offs. Make those short, rapid string bends as fast as you can for a bluesy BB King-style vibrato sound. Grip the strings firmly and turn your wrist in a wide motion for a slow but dramatic rock style vibrato. Pick each string down-up, before moving to the next string. You’ll need even, steady timing in both hands. Play a downstroke and brush your thumb on the string 24 frets above the fretted note.